As you may know i like HW & the 80 is one of my favourites but never managed to get hold of the Bavarian.If you don't know it this one came with a Laminate stock. 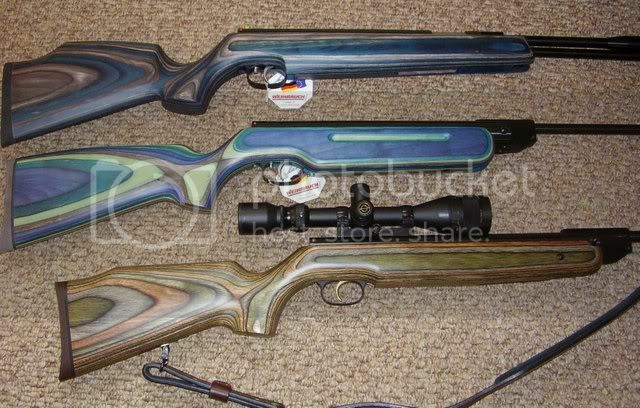 Sorry, I cant help with a laminated HW80, Ive only ever seen one, so hows about a '97, '35 and '95. I quickly sold the '97, I dont like them and have recently put the laminated '95 stock on a '95 which came with open sights. Going from what I remember in old AGWs (late 70s/early 80s) 'bavarians' were HW rifles fitted with walnut Tyrolean stocks. I don't ever recall seeing one of these in the flesh, so presumably that are quite rare....but one thing that don't need to be presumed, is my memory is a bit hazy on this. Again, my memory isn't what it used to be - what is, but the Tyrolean HW80 as far as I remember was a different beast to the laminated stocked one. I remember the Tyrolean stocked one was suitable for right and left handers. The laminated was very similar in shape to the standard beech stocks. IIRC. Join the club for memory it is tricky to recall everything. The Tyrolean 80 & 77 were indeed factory models early eighties obviously as the 80 & 77 weren't around in the seventies.Came with French Walnut with oil & dark stain finish.The ones i have seen have been handed ,mine is a right hand model . The Bavarian was the Laminate stock version . Oh, the Tyroleans were handed - its just that they fit us lefties quite well. Yes, I too recall the tyroleans were handed....and now that Landy had jogged my memory, I remember them being advertised with French walnut stocks. With the factory stocks you got a lot of rifle for not a lot more really.I was only part time back then so they all seemed mega expensive but if only we could have bought more then.I don't think these days there are many options or makes & models to choose from like the old Venom classics. They did a lovely version of the HW85K called the Sidewinder with 8" barrel & 10 " shroud/silencer,i bet this one is rare.